Learn the Trigger thumb release surgical technique with step by step instructions on OrthOracle. 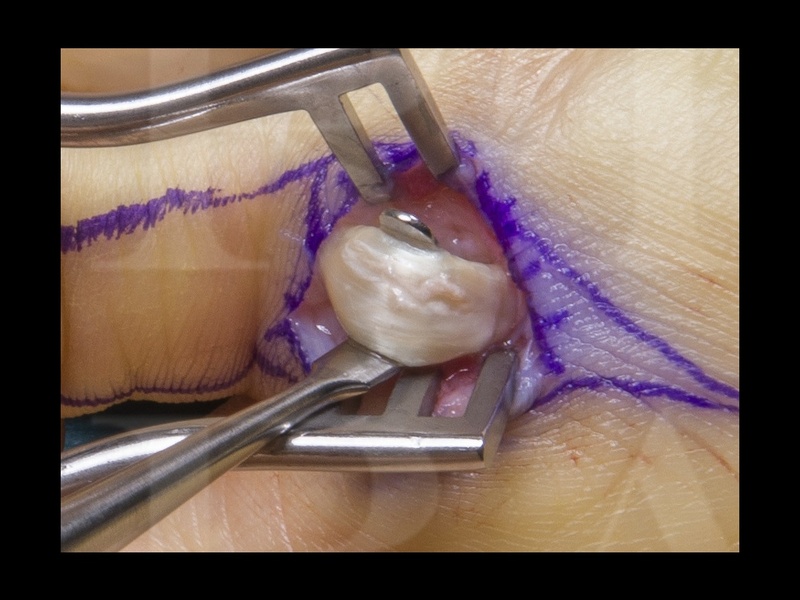 Our e-learning platform contains high resolution images and a certified CME of the Trigger thumb release surgical procedure. Most cases are idiopathic although certain factors such as repeated power gripping or trauma may be causative. (This section does not discuss congenital trigger thumb which has a different pathology and treatment pathway). Medical conditions such as diabetes, gout and rheumatoid arthritis have also be implicated in the development of the condition. On the palmar aspect of the thumb there are 3 main flexion creases. These are the crease of the IPJ and a proximal and distal crease over the MCPJ which are spaced around 5-10mm apart. The A1 pulley of the thumb is consistently at the level of the proximal most of the two MCPJ creases. Open release of the A1 pulley is a procedure usually performed for recurrent of persistent triggering refractory to non-operative treatment. The procedure can be performed as a day case under local anaesthetic and takes around 15mins for an experienced surgeon. The patient has a simple dressing and is asked to mobilise as able as does not usually require any hand therapy input. After 3-6 weeks the scar softens and full use of the hand, including tight gripping, is possible.